Structure of a standard prescription (1850s). After the 1950s, doctors prescribed medications using brand names rather than their chemical names. For example, the extensively used analgesic, antipyretic acetyl`aminophen (paracetamol) is better known in India by its brand name Crocin® or Metacin®. Before the 1950s, in general, doctors wrote prescriptions at great length, instructing the pharmacist how to compound and dispense medication. Writing a prescription was a delicate and fine art. Medical training included this dimension in an intense manner, at least until the mid-decades of the 20th Century. Prescriptions were hand-written, mostly using abbreviations of Latin terms. Symbols for measurements were used extensively: drachm (= dram) was a standard measure used in the medical dispensing world, represented by either or , following the then prevalent measures of unit the Apothecaries’ weights. A pre-1950s doctor prescription comprised three sections: a superscription, an inscription, and a subscription. The superscription was writing the symbol – either or Rx –, which represents recipe. (Some literature interprets this symbol to mean ‘take thou’.) The inscription included the list of chemicals and their quantities to be compounded by the pharmacist. 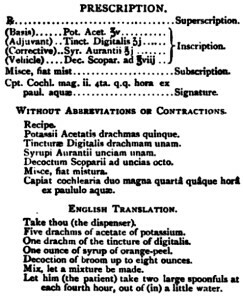 This was followed by the subscription, which instructed the patient how to use the compounded material (see figure), which could be either a liquid (mixtura) or an ointment (unguentum) or a powder (pulvis). This was followed by the signature of the prescribing doctor. Prescriptions were compounded and dispensed to users by pharmacists, who exercised extreme caution, while compounding. Early European medical schools trained surgeons up to two years in learning Latin. In the Madras Presidency, Latin was taught as a subject for candidates registered for medical titles issued by the Madras Medical College (for example, Graduate of the Madras Medical College [G.M.M.C.] and Licentiate in Medicine and Surgery [L.M.S.] until 1880-1881. Satthianadhan (1894) says, ‘Latin was omitted from the scheme of Preliminary Scientific Examination in Medicine in 1880-81.’ in his History of Education in the Madras Presidency. ‘The Chemists and Druggists Department (sic. of the Madras Medical College), which has been founded with a view to supplying well-qualified Chemists and Druggists for the Presidency (sic. Madras Presidency). The students undergo a two years’ course, at the termination of which they are required to pass the Government Technical Examination in Pharmacy’. The History of Higher Education in South India, published by The University of Madras, clarifies that further improvement of the Chemists and Druggists Department in MMC occurred in 1900-1901 with the appointment of academics with the titles of professor, lecturer, and assistant professor. By the 1920s, Diplomas endorsing every qualified Chemist and Druggist were issued by the Commissioner of Technical Examinations, Government of Madras, although the aspiring pharmacists trained in the Chemists and Druggists Department of MMC. The Chemists’ and Druggists’ Diploma was reconstituted as Bachelor of Pharmacy (B. Pharm.) in 1955. Two names sparkle in the chronicles of the Chemists and Druggists Department of MMC: J.C. David and V. Iswariah. David was the first professor of Materia Medica in MMC and has been appointed in 1931, after his PhD in Pharmacology from Britain. Iswariah took over as the Professor of Pharmacology in 1948. Both David and Iswariah figure prominently in the annals of pharmacy and pharmacology of India, because of their classic Pharmacology and Pharmaco-therapeutics, first published in Madras, in 1965. The revised edition was the work of another distinguished pharmacist-pharmacologist of Madras, M.N. Guruswami. The book was published in Delhi in 1979. Inspired by the Pharmaceutical Society of Britain (PSB), a professional society enshrining objects similar to that of PSB was established in Madras under the name Pharmaceutical Society of India (PSI) in the 1920s, essentially built by the efforts of Wilfred Pereira of Wilfred Pereira Ltd. and A.N. Lazarus of Spencer & Co. Ltd. The principal objects of the Society were to federate all qualified pharmacists of India, facilitate a uniform system of pharmacy education, and establish compulsory registration of pharmacists. A leading pharmaceutical historian of India, Harkishen Singh, remarks, “But for Madras Medical College, no other medical college in India offered a diploma of the standard as conducted in Madras. The standard of membership of the Society was sufficiently high to ensure efficient service, and the qualifications required for entry to it were approximately on par with those of the Pharmaceutical Society of Britain”. Among the several intentions identified by the PSI in its early documents, the two key ones were: (1) to include a standing member of the Society as an examiner of the candidates appearing for the Diploma in Chemists & Druggists title in Madras Medical College, and (2) the use of the title M.P.S. (India) [Member of the Pharmaceutical Society of India]. Unfortunately these aims never got approved. PSI also strived for the replacement of the term ‘compounder’ with ‘pharmacist’ and the term ‘chemist and druggist’ with ‘pharmaceutical chemist’. PSI pioneered the publishing of a quarterly journal, The Pharmacist with Rao Sahib Venkatapathi Naidu as its founding editor from July 1939, but it did not survive very long. The PSI in Madras was active during its heyday. The Society and its members played a vital role in presenting the memorandum presented to the Drugs Enquiry Committee led by Ram Nath Chopra, in emphasising the need for a Poisons and Pharmacy Act, in seeking the restriction of dispensation of medications to qualified chemists only, and in raising the quality of examinations for those aiming to qualify as compounders, so that they serve the pharmaceutical profession better and in a professional manner. This early professional Society was amalgamated with the Indian Pharmaceutical Association, then head-quartered in Benares, in 1949.